Would You Risk $54.50 to Earn Up to a 125% Return on Your Wagering Dollars?? The Brand New Angle-Oriented Racetrack Millionaire & SuperChalk! System/Software Ever — The Racetrack Millionaire & SuperChalk!! >>Research was conducted by a longtime RPM Client. ☛His data study provided him with three extremely consistent, profitable angles using The Racetrack Millionaire & SuperChalk. 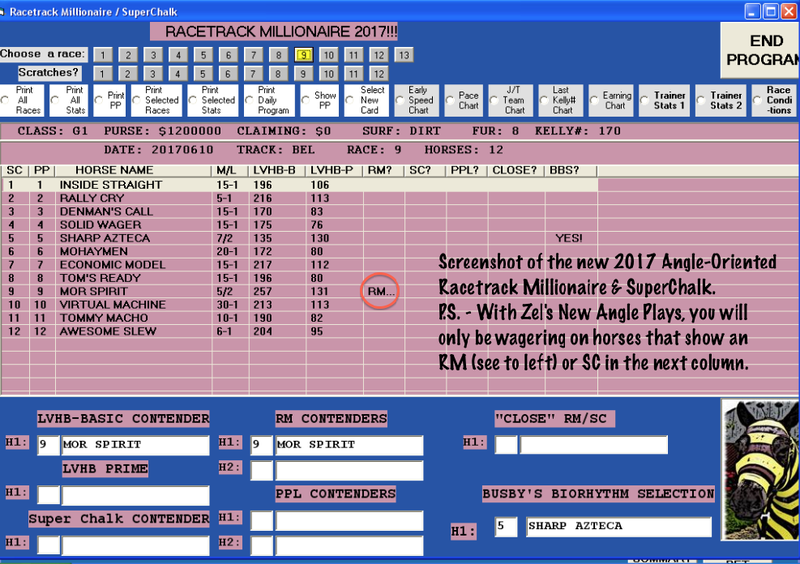 We will provide you with the Newly UPDATED Racetrack & Millionaire SOFTWARE (or paper version), as well as the THREE Newly Researched Profit Angles. Angle 1: 45.5% Win Percentage equaling a +34.5% Return on Investment. Angle 2: 55.55% Win Percentage and a +64.4% ROI. Angle 3: 66.7% Win Percentage and a +125% ROI (>>this method also produces a positive ROI when betting to show). One of the true joys about the business that we are in is that customers often offer us methods of their own, methods that they have been successful with for years. And, every once in awhile, a client will provide research on one of our own methods, coming up with an approach that we have not previously considered. And that’s exactly what occurred here. Our longtime customer, and long, long time horseplayer, Zel Fairorth of Illinois, loves to research handicapping angles as much as he loves to play the horses. He has provided us with good data on other methods we have offered, but his work on The Racetrack Millionaire & SuperChalk really takes the cake. Using our software, he has come up with three plays, one with just one rule (condition) you have to look for, the others have just two rules. And, if you are using the software, these plays will jump right off the screen for you in seconds. If you are using the paper version, you are still only talking about a couple minutes to identify a play. There is no guesswork involved. A play is a play is a play – it’s that simple. 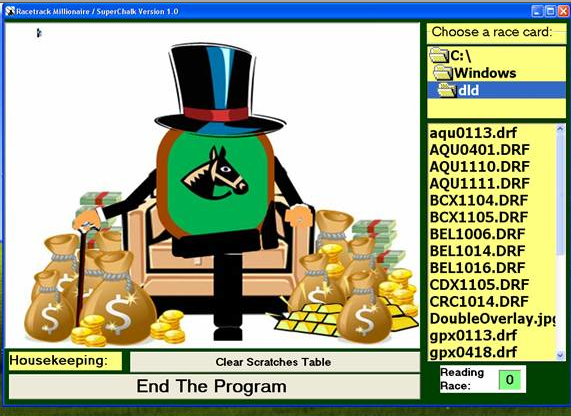 As many of you are aware, The Racetrack Millionaire & SuperChalk is a high, high percentage win (and place and show) method, but it is also very much a ‘spot play’ system. In otherwords, if you crave action, this is not the method for you. You will average @1 play per day per racecard. There will be days when there are no plays, and days when there are two or three. Why? Because we know many of you have had a version of RMSC previously, and it would not be fair to charge the full-boat price. >>>>!! !But – This is the newly upgraded 2017 version of RMSC, which includes new features, including the new Busby Biorthym Selector, a true action-getting feature. So even if you never use the New Profit Plays from Zel, you are still getting one heckuva BIG Bang for your buck! So, for most players, this is a total no-brainer. If you want to put some extra cash in your jeans, and you can be a little bit patient and follow simple instructions exactly, pick up the phone or go to our website and order.